Kiwi ingenuity, home made pit-fire kiln. A woman places bricks on top after the kiln has been lit. Kiwi ingenuity, home made pit-fire kiln. 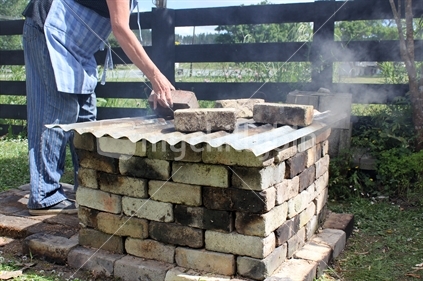 A woman places bricks on top after the kiln has been lit - mychillybin genuine NZ photo image.